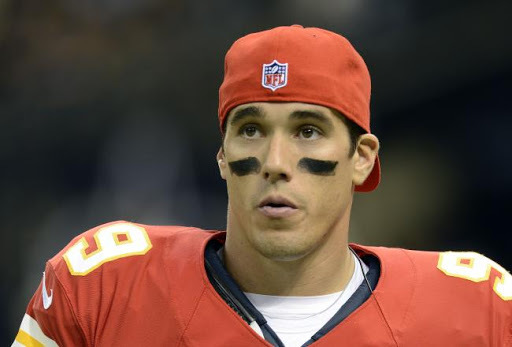 technology | In the Key of "H"
I have to say I never was much of a Brady Quinn fan. First of all he came from Notre Dame, and then there was some weirdness with he and Tebow in Denver. But after yesterday, count me among the converted. In case you didn’t hear, Kansas City Chief’s linebacker Jovan Belcher murdered his girlfriend and then committed suicide at the Chief’s complex this past Saturday. The Chief’s then turned around and played the next day without their starting linebacker and beat the Carolina Panthers. What “converted” me was not his ability to help lead his team to only their 2nd victory but what he said in the post game comments. Comments that had nothing to do with football but instead everything to do with relationships. “The one thing people can hopefully try to take away, I guess, is the relationships they have with people,” Quinn told reporters after the game. “I know when it happened, I was sitting and, in my head, thinking what I could have done differently. When you ask someone how they are doing, do you really mean it? When you answer someone back how you are doing, are you really telling the truth? Here are some of my thoughts on his comments. 1.) First of all, I love how he is willing to try and learn anything from this malfeasance without assuming blame. Several folks noted that they deemed nothing wrong with Belcher or his relationship with his girlfriend. But obviously there was something wrong with Belcher, if not with Belcher and his girlfriend. And it is clear that someone knew about these problems and was seeking to do something about it. Apparently……. That detail was among the troubling revelations about a relationship that had more problems than previously realized. According to Kansas City Police Sgt. Richard Sharp, the team knew about their issues and was “bending over backward” to help. And so it cannot be construed in any way to be the fault of Brady nor any of his teammates, nor anyone else that Belcher followed through on such machinations. In my mind he avoids the “We can’t learn anything from this” and the “It was our fault and his blood is on our hands,” response that comes with situations such as this. Yet why not try to learn from the situation? 2.) In regards to “what we can learn,” his wisdom exceeds his age (and career touchdowns) by a wide margin. More specifically as how it relates to truth in relationships. When you ask someone how they are doing, do you really mean it? When you answer someone back how you are doing, are you really telling the truth? A. Do you mean it? I appreciate his challenge to ask and answer questions with a deeper concern for the truth. We could all do a better job at that. As Christians who live in the time after Jesus’ first coming and before His Second Coming, we experience both the joys of redemption accomplished and applied to us now, and but still groan and long for the final redemption of our bodies in new world then (Rom 8:18-27). So we can say, “Yes I’m doing well,” or “No life is rough right now.” Both are consistent of our Christian experience now. B.Truth WILL ONLY be divulged in safe relationships. The deeper and more personal truths will only be revealed in really safe relationships. Surface relationships will lead to shallow truth about someone. What you will/can tell about yourself and what they will/can tell you about themselves is probably only going to happen, at least on a regular basis, if you and they engage in deep and safe community. And deep and safe community only results when folks make time and commitment to be in such a deep and safe community. C. Deep relationships don’t necessarily lead folks to know you. I’ve been in community groups where I’ve come to know stuff about people. Sometimes more than I wanted to know (though I’m glad I did). I’ve been in community groups, as well, where I’ve known next-to-nothing about others. In such cases if they were to divorce or murder or commit suicide, or become depressed, I would have no idea. And that is sad but true. Deep relationships and community may be available and offered but just the presence of such a community does not mean folks will automatically take advantage of it. You and I may be in place to share our lives but stay silent or on the surface. On the flip side you or I can be a part of a deep and safe community, but others may not divulge any poverty of spirit, material, joy, etc….Some folks, even despite deep and safe community, will divulge nothing. And it will be to their great loss. D. Deep relationships and community always involve you taking the lead. If you want to take seriously Brady Quinn’s concerns, and he’s only reiterating what it means to love your neighbor (you probably have heard that one before), then there is something you can do which may foster others being honest about their struggles. Someone has to take the lead. Such deep and safe communities/relationships don’t automatically spring up. People will only go so far as you lead them. Yes there are exceptions for the guys/gals who wear hearts on their sleeves (or jackets for this time of year), but as a rule, people have to be led to share truth. And often they will only share something that is on the same level as that which has already been shared. For instance if you share, “I need prayer for Aunt Bessy, because she has hemarrhoid surgery,” then don’t expect to get back an, “I’m struggling with my child right now, as he is in a very difficult phase in my life, and I need prayer to love him through this, because right now I don’t.” Aunt Bessy’s hemarrhoids will be covered in prayer, but the struggle of a parent to love his/her child will not. You won’t even know that problem exists until you take the lead in sharing your personal struggles first. And this is hard. Very hard. Deep relationships and community take time of course. But time alone is not enough. No one makes the “jump” unless you first lead them. E. Technology and actual relationships don’t naturally coexist. They don’t appear to fight like cats and dogs, but the latter slowly loses that fight unless we intentionally value and prioritize real relationships. Emails and facebook can be very helpful, but they are at best only supplemental. You don’t know someone, nor are you known by status updates. You know and are known by spending time together. The question is, “Is it worth it?” Brady says yes, and I think the “one another” passages in scripture suggest he didn’t say it first. Again this is hard, and we have to get creative amidst certain seasons of life (and no matter how creative we get, some seasons don’t afford much community/relationship development), but well worth it in the end. We could all benefit from Brady’s advice to intentionally put ourselves in the path of potentially deeper relationships not only to know but also to be known. Who knows what good could come? I would say a lot. Consider me a Chief’s fan for the rest of the season. My last post focused on how not to use your cell phone during corporate worship. But recently I have come across some helpful ways to use technology in and outside church. 1.) All kinds of tablets offer various versions of the bible. Provided you can resist the urge to check facebook or update your fantasy football roster, tablets can be quite helpful. A woman in our church actually takes notes within the electronic bible app. So in essence she is creating her own “study bible” whenever she hears the word preached. Since we at Redeemer preach expositionally through books of the bible, she will have “commentaries” on various books or sections of scriptures (like the Sermon on the Mount which I’m preaching). 2. 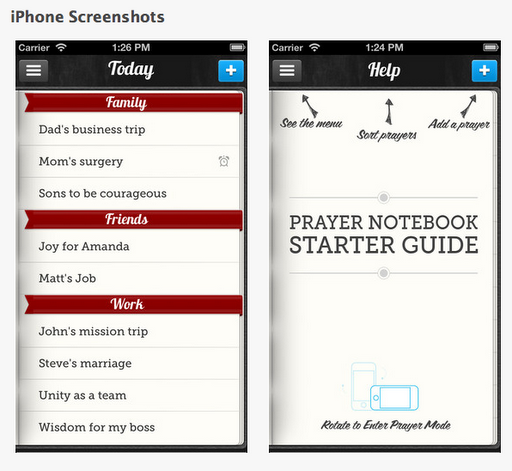 I’m not very technologically advanced compared to most, but I’m still benefiting from the Prayer Notebook app. Tim Challies recently shared a number of prayer apps for iPhones here and I ended trying the free version of the app called Prayer Notebook Lite. After I saw how it worked, I felt it worth the price of $ 1.99. One of the more convicting things about the app is that I’m now realizing folks I’ve simply not prayed for. But the bright side is that I’m praying for more folks and more situations now. While I’ll never pray for everyone as much as I would like, fewer people are slipping through the cracks. The app allows you to separate requests into categories, days of week, mark as “answered”, and will even send you reminders if you want. Just started using it a few weeks ago, but very helpful, especially for those requests which fit outside my normal categories. If you have any other helpful apps, please share them. Shoud you facebook and tweet during church? A pastor in Arizona actually encourages social media during the worship service. “What” say you, or at least that’s what I say. I’m a pastor. Is that really a good idea? I confess now that I have a smart phone, I use it all the time. I take it places where I probably shouldn’t. But is “having to have it” all times a good thing? My wife says no, and I think I agree with her. And I’m pretty sure Jesus is on her side on this one. If you watch the short clip, which of course you should, you’ll see a pastor leading his congregation to share the gospel on facebook and other social media. During the service. He argues that the church should be ahead of the times and take advantage of these opportunities. As one who tends to embrace the pragmatic, I can sympathize with this direction. The Reformers certainly embraced technology in the form of the printing press. They took great advantage of it, and one wonders what kind of influence they would have had without that wonderful piece of technology. I don’t remember Luther or Calvin saying, “I want to go ‘old school.’ Let’s just get some people to hand-write our materials. Helmut or Pierre, you guys have good penmanship, right?” Nope they took advantage of what was out there and used it for the spread of the gospel. 1.) Cell phone idolatry. We’re on our cell phones 24-7. Can we not take a break from them, taking our gaze off our idols (even if we’re using them for good things like inviting folks to church)? Aren’t we more like Ryan from The Office than we want to admit? Who greater to deal with our idolatry than the beautiful risen Savior King Jesus? 2.) Church and worship. Should the church worship service be a time no different than any other during the week? Or is it a once-a-week special time when God’s covenant people gather together to offer up their hearts, minds, time, wallets, voices to serve the God who has graciously saved them and lavished them with grace? Invite people to worship. Ask early and ask often. But when God issues His call to worship Him, just direct your attention on Him as much as is possible. You’ve got tons of time to invite folks over facebook, twitter, text messages, etc…. 3.) Are invitations during worship more effective than invitations extended before or after church? Do you really think its more effective to take a picture of yourself singing and then tweet it to others than to send the same message after or before worship starts? Perhaps the most effective communicative tool is asking someone in person. You don’t even need a cell phone plan to do that. Other pastors have thought through the issues of technology during worship. Some don’t even want power point or media shout. Some think printing words in the bulletin is from the devil (God only wants you to sing out of man-made hymnbooks I guess…). That’s not me. Use technology for God’s glory, our edification, for outreach and mercy. Use technology but don’t let technology use you. I think someone smarter than myself probably already said that once. Or twice maybe…. Next post will be on some spiritual benefits of technology folks have passed on to me.